This week I’m featuring information about where to buy sweet potatoes and spices here in Cuenca, EC. 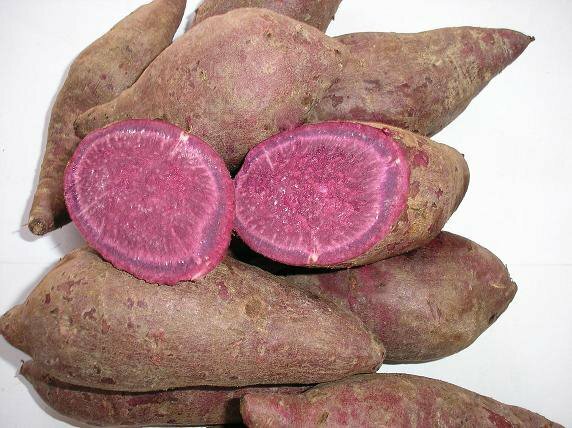 In response to an article that I wrote on Cuenca HighLife, readers submitted tips for locating and cooking sweet potatoes (camotes) and different spices. Thanks for all of your contributions! A number of readers wrote to say that sweet potatoes are called “camote” or “camote amarilla”, and are found in a number of fresh mercados in the city. Other readers have also commented about using a microwave to start them off (I like to do this too): Bob reminds us to use a fork or knife to pierce the skin in a few places before microwaving (and scrub and rinse). Gary at Gary’s Cakes & Bakery wrote, “The yellow orange sweet potato is called a batata, pronounced using the soft b or v sound. Most mercados do not have this but carry the purple camote. The camote has a similar flavor and texture but is not the same as the batata. Here in Cuenca, water boils at about 198 F. If one is making a candy, you have to adjust the temperatures on your candy thermometer down by those 14 degrees F. When baking, it is a good idea to buy an oven thermometer and check the thermometer against the dial on the oven. I have found most ovens are way off the mark of the dial. And Kathy wrote also about the “sweet potato lady” at the Feria Libre “who sells the best sweet potatoes I have ever had anywhere, hands down. The potatoes are from Peru (I just learned Peru has 3,000 kinds of potatoes). They look more like yams and it cost me about $1 for 5 big ones and she also sells dried chili peppers and Peruvian dark beer. I cook them in the oven at about 350 degrees for an hour and a half. You could also use a slow cooker. So the difficult part is where in the Feria Libre is this lady? (who is very sweet and looks like a kindly grandmother). She is not with all the other folks who sell potatoes. A friend found her by asking for sweet potatoes (camote) and I would add “de Peru”. Chuck wrote to say, “The Comote lady is Amanda. Her booth is easy to find. Go to the street, parallel to las Americas, in back of the fiera libre. About mid block, look on the opposite side of the street from the market for a tienda named ¨Abcderia Israel¨. Directly across from that tienda is a small square building with bars on the windows. Amanda´s booth is between the small building and the market proper. Amanda sits with her back to the small building. When she sees a gringo approaching, she usually holds up a comote amarillo cut to show the yellow orange color because she knows that gringos prefer them to the purple variety, which she also sells. “Kong’s Mom” has some great recommendations: “My spice, grain and nut ‘go-to’ place in Cuenca is Esafran located on Padre Aguirre between Pres. Cordova and Juan Jaramillo in El Centro just south of the San Francisco market. The glass counter is full of nuts and spices and is almost flush with the sidewalk. You verbally request the items you want and the clerk brings them to you at the counter. This store stocks loads of items at fair prices e.g. golden raisins, dried cranberries, mustard seed, thyme, rosemary, cloves [whole and ground] along with a good selection of nuts e.g. peanuts, walnuts almonds [whole and slivered] and hazelnuts. Also quinoa, whole oats, sesame and flax seed can be found along with a host of other seeds, grains and goods for baking. For cayenne, I just recently found a source at ‘Live Green Superfoods’ at their store at Luis Moreno Mora 323 y Francisco Moscosco. They have another store at Gran Colombia y Padre Aguirre but I don’t know if they stock cayenne there. To check on supply at this store you can contact owner Marcelo Garcia at marcelogarciap@hotmail.com or check out their Facebook page livegreensuperfoods. I wonder if the yellow and purple camotes have the same nutritional benefits. One would think that the darker the color, the better – more bio-flavanoids. This is an example of knowing the North American fruits/veggies nutritionally but not so much what we get in Cuenca. Google tells me that potassium (12% per serving) and fiber (4 grams/serving) and that’s pretty good on nutrients that we don’t always get enough of. Hi Terry! Yes, that’s so true – the deeper the colors the more intense the nutritional content, but we eat all the colors of the rainbow – and intensity can be a bit overwhelming, and sometimes you can moderate with some lighter shades for balance. Don’t be afraid of “less nutritious” fruits and veggies – eating a variety of foods assures us that we’re on the right nutritional track.